A new international safety skills training programme saw a successful launch recently at TWI headquarters in Cambridge. The collaboration between TWI and the Lloyd’s Register Foundation will enable upskilling of workforces in welding, inspection, non-destructive testing and health and safety courses to international standards. The training programme known as the South and East Asia Skills Enhancement Programme (SEASEP) will be delivered in India and South East Asia countries, starting in Indonesia. Launching the new programme, left to right: Dietmar Kok, TWI South East Asia; Ernie Moskini, TWI South East Asia; Abbas Mohimi, TWI; Tim Slingsby, Lloyd's Register Foundation; Aamir Khalid, TWI and Shervin Maleki, TWI. TWI is the delivery partner for SEASEP and is engaging with local industry and stakeholders to enhance local safety standards through delivery of internationally accredited training courses. 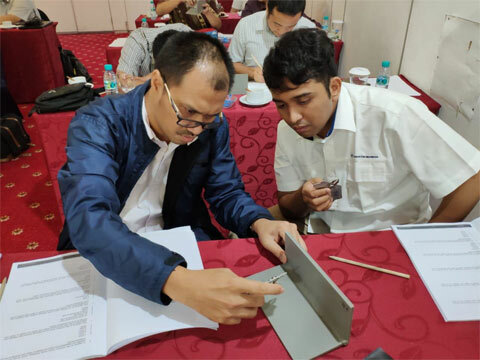 The Indonesia phase of SEASEP started in October 2018, and in the first month saw 40 candidates trained in visual welding inspection by TWI’s experienced lecturers at the organisation’s Jakarta office. The first CSWIP Visual Welding Inspection courses under SEASEP have taken place in Indonesia. Individuals, companies and government organisations in Indonesia and India can contact TWI to find out more about participating in this programme.